A former Broadlands Academy pupil has earned a place as a finalist in competition that aims to find the country’s most enthusiastic and hard-working apprentices. 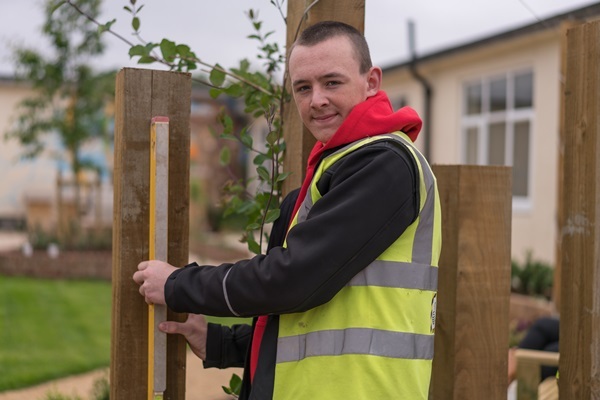 Joe Page, 17, became a carpentry apprentice with Redrow Homes in September after completing his GCSEs. Now, along with eight colleagues from the company’s Bristol office, he is in the running for apprentice team of the year, representing the South West in the national finals of the Brathay Apprentice Challenge. To reach the finals, the team have made 11 visits to schools and youth groups to talk about the benefits of becoming an apprentice as well as redesigning and rebuilding a garden at a young carers’ centre in Fishponds so that the young people have somewhere to relax. They also hosted a business event to talk to employers about hiring apprentices. Joe said: “It’s fantastic to be chosen as finalists as everyone on the team has worked so hard to get here. The team will go to Brathay Trust’s Windermere headquarters for the logistical and teambuilding finale on June 14, facing competition from other teams from organisations including Derwent Training Association, JCB, GlaxoSmithKline, IBM, Nottingham City Homes, Severn Trent Water and WSP.